A very brief and late post today. my desk is in chaos, so no picture. I wasn't even going to post but didn't like putting 'No desk today' after comments on other people's desks. On Sunday evening I was stamping, and trying to be organised I had actually got a bowl of water to wash used stamps, and some of you will already worked out where this is going. Before I went to bed I fished out the stamps, put them on kitchen paper to dry and put the bowl 'safely' on the window sill. Monday morning came and as I pulled the blinds the bowl of water came with it. A pint of water goes a long way and paper absorbs it very quickly and ink runs and 70% of the stuff on my worktop got wet. Some is salvageable and same has gone straight in the bin, and I am just feeling miffed with myself for being so stupid. Added to that other things going on in my life are also very frustrating, so will just be visiting and encouraging others today. And hoping that my mojo will turn up sometime soon. I've just editted this, it sounded as if I am feeling really sorry for myself and after sympathy, but just rather miffed with myself and not able to post anything worth while. Oh bad luck Chris :-( I've spilt tea over fabric before now....luckily the stain came out in the wash. Phew. And no one will blame you spouting off, we all understand! Fingers crossed that you can rescue something from the disaster. Awww Chris... You poor thing! Whatever you say, you do deserve sympathy for this! What an awful thing to happen. 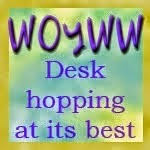 I'm glad you decided to come on WOYWW and share it, because as we know, ALL sorts and conditions of desks are welcome here - even wet ones, although I don't suppose we've had many of those in the past!! I have brainfog with my M.E. and on the M.E. forum I belong to they have a whole section devoted to the "foggy" things we all do, and it's absolutely hilarious! I have run the bath with no plug in (invisible thorugh the bubbles), boiled a pan of water for 15 mins before I realised there were no potatoes in it, thrown all the prepared vegetables in the bin and kept the skins and stalks, pulled 2 plates loaded with food onto the fold-down door of the grill and then shut it again, flipping all the food off into the inside of the grill, and instead of using my little measuring cup for the water for my breakfast porridge, tried to fill a funnel instead!!! So you think you've got problems... ROFL!! If you didn't laugh, you'd cry! Sometimes I don't think I'm fit to be let out. Dare I say it - happy WOYWW? Lol! Oh - PS - thanks for your lovely and understanding comment on my blog - I want the card to be really special, and to reflect the family's very strong Christian faith. And yes, my hubby is a saint and a mega star rolled into one, although whenever I say so, he denies it! His tooth is now out, and rather tender, understandably, but apparently it wasn't too bad. Oh dear, Chris - but now I really think you should take heart from all the encouraging - and I have to say, hilarious - comments on this post!! See you soon. Hope you are able to see your way forward soon re the hull and electrics!! Here's another big hug, use it as an excuse to have a lttle rest and maybe do a bit of blog hopping until you feelin the mood again. I felt all sorts of the emotions you conveyed as I read this Chris, including a pity party for yourself and no wonder! We all need them at times and if there was ever a time to have one, this was the time!! Poor you! And I could also sense your frustration with yourself. Oh, goodness, we have all been in those shoes more than once. I always feel as if I'm being punked by spiders or something when it happens. Like they are up in the ceiling or behind the curtain laughing their butts off! Now, see, I'm old enough that I would have just calmly gone and picked up the camera and taken a picture before I started cleaning and tossing! Because, honestly, we have ALL been there and it would have (and has) brought back memories of those times! Oh dear, how annoying. Didn't feel you were after sympathy, just telling us of your 'water adventure'. Bet it was a real mess for you to clear up. Take a hug from me and forget all about it. Hope we see you next week with some makes.